The Cornerstone family of windows provides beauty, performance, value, and uncompromising quality. From its classic design and rich traditional style to its ultra energy-efficient performance, the Cornerstone delivers. It’s available in single hung, double hung, picture window, 2 and 3 lite horizontal sliders, and many custom architectural shapes. Increase the energy performance to the level you desire with our Energy Smart and Solar Smart Energy Packages. We offer many options to keep your home cool in the summer and warm in the winter. You can add your own designer touches to your windows with our many different divided lite and decorative glass options. We offer many options to give your windows a distinct accent. Cornerstone windows allow you to create an endless array of design possibilities with its vast selection of styles, sizes and shapes. Give your openings some flair with operable architectural shapes. With this series, you can create any number of architectural shapes, from circle tops and eyebrows to trapezoids and triangles; it will fill your needs. With Cornerstone there’s no need to sacrifice aesthetics for performance. Our windows are designed to enhance the look of your home and keep it safe from the elements. The 3 ¼” multi-chambered frame provides superior strength, rigidity and durability. The added depth allows the face of the frame to be narrower, which lets more natural light into your home. Every corner of a Cornerstone window is precision fusion welded; no screws or silicone. The high performance true-sloped sill directs water away from the window naturally, while the auxiliary water evacuation route provides extra protection during the harshest weather conditions. The vertical sill interlock and the high performance compression seal with barrier flap provide structural strength and protection against air and water infiltration. The Cornerstone Series window is versatile in almost any application. The window frame can be ordered as a block frame, with a nail fin, or with a nail fin and J channel for siding applications. Whatever your needs, this series of products can more than fit the bill. The Vanguard Advanced composite cam lock is designed to provide maximum protection from forced entry and to seal the window tighter as it locks. These American-made composite locks contain no zinc or lead. The marine grade composite material has been shown to be superior to metals in strength, impact resistance, and corrosion resistance. The sloped cam pulls the sashes together and also forces the sash downward to compress the seal against the sill. Cornerstone Series windows use a heavy duty tension spring block and tackle balance system which provides extremely reliable, smooth and quiet, long-term operation. This high performance balance can safely handle a 45 pound sash. 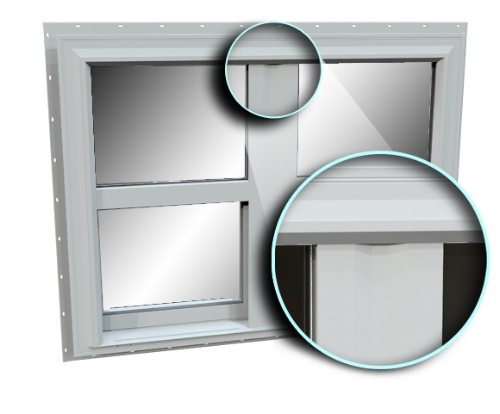 The specially designed system allows for full sash travel and allows a 35 ½” x 59 ½” window to meet the 5.7 square foot opening requirement for egress. Our locking balance shoe and pivot bar system maintain a constant connection to the sash. Cornerstone Windows allow you to create an endless array of design possibilities with its vast selection of styles, sizes and shapes. Give your openings some flair with operable architectural shapes. With this series you can create any number of architectural shapes from circle tops and eyebrows to trapezoids and triangles, it will fill your needs. If larger openings are what you are looking for, create expansive spaces with our innovative “continuous head and sill” design. The continuous head and sill allows for multiple units to be constructed in a singular frame, providing superior durability and longevity over mechanically joining two separate windows. Whatever your needs, this series of products can more than fit the bill. 1. 3 ¼” Heavy duty multi-chambered frame depth provides strength, insulation, and durability. 2. Defined beveled exterior gives the Cornerstone Series crisp, clean sightlines and an enhanced appearance. 3. Structurally reinforced center meeting rail with contoured design and dual wall construction provides superior strength and performance ratings. 4. Full interlocking meeting rail with full length fin-seal weatherstrip, in conjunction with the locking system, ensures maximum security against forced entry and the outside elements. 5. Attractive heavy-wall rectangular glazing beads with co-extruded durometer seal provide a tight seal against the glass. 1. Dedicated head extrusion is specifically designed to eliminate snap-in accessory adaptors and allows for superior strength, insulation, and rigidity for shaped top products. 2. Optional operational control device can be added to meet code requirements. 3. Low profile “EasyTouch” tilt latches offer easy operation and cleaning. 4. Dual wall construction increases strength, rigidity and insulation where the glass meets the frame. 5. The integral ergonomic lift rail located at the glass line allows fingertip control with safe and easy operation. • Precision fusion welding ensures that the sash and frame joints are completely sealed and perfectly square. • Virgin uPVC construction is virtually maintenance free and provides exceptional insulation value. • 3/4” insulated glass with warm edge technology upgradable to 7/8” triple glaze insulated glass for maximum insulation value. • Cornerstone windows have narrow frame and sash profiles to maximize your viewing area.